(Makes 5 gallons) Mike makes great beer - just ask anyone in the shop. In fact, we all look forward to Fridays when Mike usually comes bearing gifts in the form of big Ambers and hoppy IPA's. 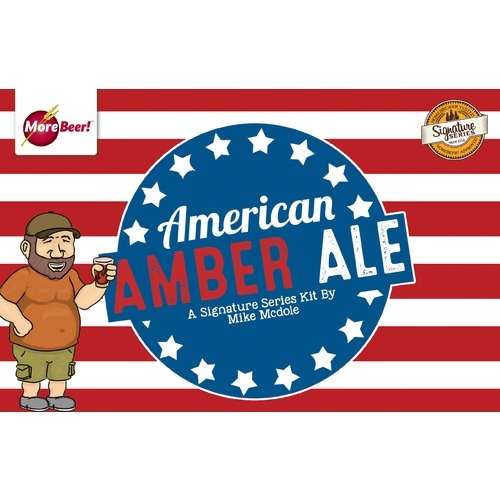 So when his American Amber took Second Place out of 96 other Amber Ales at the 2003 Big Batch Brew Bash held by the KGB homebrew club in Houston Texas, we were not too surprised. We have been after him for awhile now for this recipe and he finally gave his consent, allowing this to be the 11th Signature Series kit. Mike started brewing about 7 years ago and has not stopped since. This beer has won 4 first Place Ribbons and 3 Second Place ones, and it definitely shows. 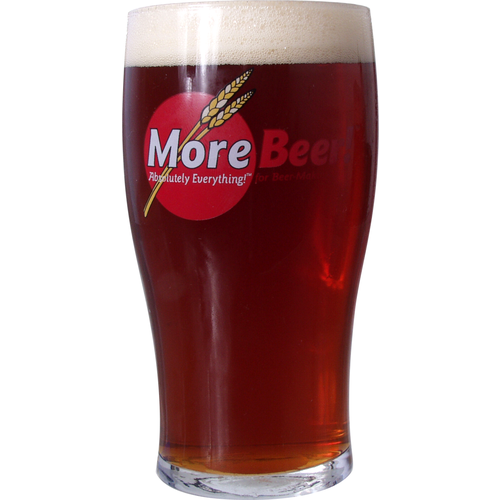 With about 13 pounds of malt and 4 hop additions, this is a full-bodied, hop-forward beer. Not for the weak of heart! Mike uses White Labs California Ale Yeast, WLP001. For brewers who like to adjust their water, Mike has included his mineral adjustments for you: Ca - 110 ppm; Mg - 21 ppm; Na - 21ppm; SO4 - 333 ppm; Cl - 45 ppm. The Mash and Sparge water are adjustd to a PH of 5.6. Mike also recommends a Sacchrification rest for 90 minutes at 152 followed by a 15 minute raise to 170 and a 15 minute Mash Out rest at 170. Recently, this beer won the Gold Medal at the National Homebrew Competition in Las Vegas! Mike was on hand to accept and, as usual, he had a full keg of his beer there to share. When it comes time to drink this beer, raise one for Mike. I have read the reviews and it sounds great! Excellent brew and I will make again. I tasted more chocolate than I would have liked. Next time I'll reduce to 2oz chocolate malt and see what happens. The only problem is that you run out. This is a pretty decent beer. I would make again but with a slight adjustment. I was hoping the IBUs would blend better than it did so I'd cut back on that. I may also cut out the dry hopping. Definitely a recipe to tinker with. Also, I'm only 3 weeks in so maybe letting it age a bit would help. Standard beer on tap in my home. 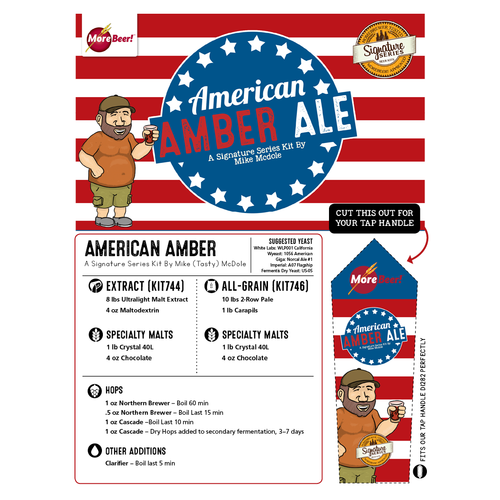 I like my Amber beers and out of the different kits/recipes I've tried, I found this one to win out and now keep this regularly on tap. This beer turned turned out as good as the reviews i read before buying. The beer is very dark but the body isn't heavy. Turned out excellent and was worth all the effort to make. Tasty developed it, so you know it's gonna be great! Reminds me some of Mac&Jacks, however, I don't do the dry hoping, as I don't care for it as much. But other than that really enjoy this beer and always have it on Tap. Really comes into it's own in 3 months in the bottle. My new favorite! This is an Amber that just fits together and really tastes great. Great job Mike!